One Twin Size Quilt and One (1) Euro Sham by Pottery Barn Kids in the Thomas & Friends Bedding Collection. When their wheels are worn down, have your little engineer snuggle up and fall fast asleep in this Thomas & Friends Quilted Bedding. Featuring their favorite blue tank engine and his friends Percy and James, this cotton quilted comforter and shams will keep them warm and cozy as they dream of railroad adventures. Quilt is expertly stitched by hand. Quilt and shams reverse to solid blue. Filled with 50% cotton and 50% polyester blend batting. A cotton weave is a tightly woven weave, which gives the fabric a soft finish while providing durability and ultra breathability. Bedding is yarn-dyed Fibers are treated individually with environmentally safe dyes before weaving to offer vibrant, lasting colors. 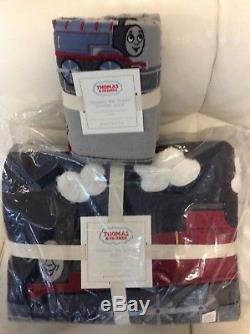 The item "Pottery Barn Kids Thomas the Tank Engine Twin Quilt & Euro Sham NWT Train" is in sale since Saturday, February 2, 2019. This item is in the category "Home & Garden\Bedding\Quilts, Bedspreads & Coverlets". The seller is "lineva1" and is located in San Marcos, Texas. This item can be shipped to United States, Canada, United Kingdom, Denmark, Romania, Slovakia, Bulgaria, Czech republic, Finland, Hungary, Latvia, Lithuania, Malta, Estonia, Australia, Greece, Portugal, Cyprus, Slovenia, Japan, China, Sweden, South Korea, Indonesia, Taiwan, South africa, Thailand, Belgium, France, Hong Kong, Ireland, Netherlands, Poland, Spain, Italy, Germany, Austria, Bahamas, Israel, Mexico, New Zealand, Philippines, Singapore, Switzerland, Norway, Saudi arabia, Ukraine, United arab emirates, Qatar, Kuwait, Bahrain, Croatia, Malaysia, Brazil, Chile, Colombia, Costa rica, Dominican republic, Panama, Trinidad and tobago, Guatemala, El salvador, Honduras, Jamaica, Viet nam, Uruguay.